Will code enforcement help prevent overcrowding? Here’s an interesting article on the Latino advocacy group that focuses on Code enforcement. Of course their findings are biased and one sided, but entertaining. Aggressive code enforcement won’t reduce overcrowding among Latinos living in the Chicago suburbs, a new report by a Latino advocacy group found. “(Ramping up enforcement is) a risky and ineffective approach,” stated the report released Tuesday by Chicago-based Latinos United. really, do you expect they would have said anything else. Must of been a quick study. Fire Chief Shuldt was able to defuse a potentially explosive situation, prior to the March 18th, Carpentersville Village Board Meeting. A high ranking police official got into a heated debate with a local resident. Another local resident who witnessed this “MATCH”, asked Fire Chief Shuldt to step in, which he did without hestitation, he professionally and respectfully, defused a potential firestorm. This man has shown he can put out more than one kind of fire. His commitment to the community and the families of Carpentersville is exemplary. Is it just me or is all of B. S. Sarto’s supporters hypocrites? I’m quite puzzled by some of these cohorts of B. S. Sarto, the same ones who point their fingers at people and scream that they are lawbreakers, morally and ethically bankrupt, racists and bigots. Even trustee Linda R. Sliwinski and V.P. B. S. Sarto get in the act and call their fellow trustees the same names. Now, let’s dig into some of these fine citizens past and see if they can pass their own “litmus test” on moral and ethical behaviour. Hmmmm, let’s start with Adam Ruiz. Well, Mr. Adam Ruiz let’s go back to the Spring of 2007. Just outside of Village Hall, you were outside with one of your Hispanic friends. You started to scream at Frank Stoneham [it was really Bob Kreibl] and you yelled that he better watch out or you’ll press charges. Which he replied, what are you talking about? Mr. Ruiz continued the ranting, raving, screaming with his arms waving in the air! He repeated that you better watch it, I’ll go to the police!!! Bob replied with a stern, “GO AHEAD!! !” So, you went into the lobby and complained that Frank Stoneham was harrassing you, threatening you and just plain intimidating you. You wanted those police officers to arrest him. Well Mr. Ruiz, the cops did come out and went to the REAL Frank Stoneham and told him to go nowhere, because there might be charges pressed against you. Not only was the REAL Frank Stoneham surprised, but so were FOUR OTHER WITNESSES who all said that Frank Stoneham just walked out with us and did nothing. Bob Kreibl also protested loudly, that this was a set-up! Well, guess what boys and girls, the cops came back out and said that Adam Ruiz pointed to Bob Kreibl, which he thought was Frank Stoneham. The Carpentersville police escorted Adam Ruiz out the backdoor. You see Adam Ruiz at the time was a “newbie” at Village Hall meetings and he knew of the charges that Paul Calusinski and B. S. Sarto had made against Frank Stoneham. So, someone must of told Adam Ruiz that Frank Stoneham is the guy who wears “Illegal means Illegal” button and wears cowboy boots. Bob Kreibl was also wearing the same button and also likes to wear cowboy boots, but the similarities end there. Frank is about 6 inches taller than Bob and Bob is, shall we say more husky than Frank. Obviously, a crime was committed, but Frank and Bob just shrugged it off, thinking they would never see him again. If they knew then, what they know now, they would of pressed charges on this creep! He’s also a proud pro-illegal advocate, who likes to hang out with other fine and upstanding individuals like, Paul Calusinski and Fernando Leyva. Yes B. S. Sarto rewarded Adam Ruiz with a position on the Improvement Committee. My next column will be about the antics of Paul Calusinski and Fernando Leyva. After that I’ll cover trustee Linda R. Sliwinski and our deranged Village President B. S. Sarto. Is B. S. Sarto mentally unstable? If any of you have not witnessed the Village Council Meeting last night, I encourage all of you to either, get the DVD of last night’s meeting or watch it on Cable. B. S. Sarto not only tried to throw out innocent middle aged residents from the audience, he threw a major tantrum at his fellow trustees! He looked like a spoiled child who cried and whined, because nobody, but his lone ally Linda R. Sliwinski aka Latino Leader didn’t agree with him. I believe that B. S. Sarto is mentally ill and needs to seek professional help. This poor excuse of a man is becoming more and more unstable. His mental illness is affecting not only his decision-making at Village Hall, but is now hurting the image of Carpentersville. Just like President Nixon in his final days as President, drank too much, started to talk to pictures of past Presidents and became overwhelmingly paranoid. Please B. S. Sarto, seek help, before you go off that edge, where you’ll never, ever come back. I just got a phone call from someone telling me that there’s a Police Investigation into the the passing out of fliers over the weekend which had a hand written hate message. We’ll keep you informed as information becomes available. Here are the fliers being passed out by Paul Calusinsky and Fernando Leyva sponsored by the Garbage CAN web site and probably Village Idiot Sarto. Several statements have been made in the media that the “witch hunt” for Humpfer’s removal has nothing to do with the submission of the Illegal Alien Immigration Relief Act but is only in response to his recent conviction. One of the fliers distributed this past weekend . BOTH ORIGINAL ONES OF PROPOSAL ANTI-MIGRATORIA which in my language means: the original sponsors of the Illegal Alien Immigration Relief Act. Interesting that this statement is made in the Spanish version but not in the English version of the flier. 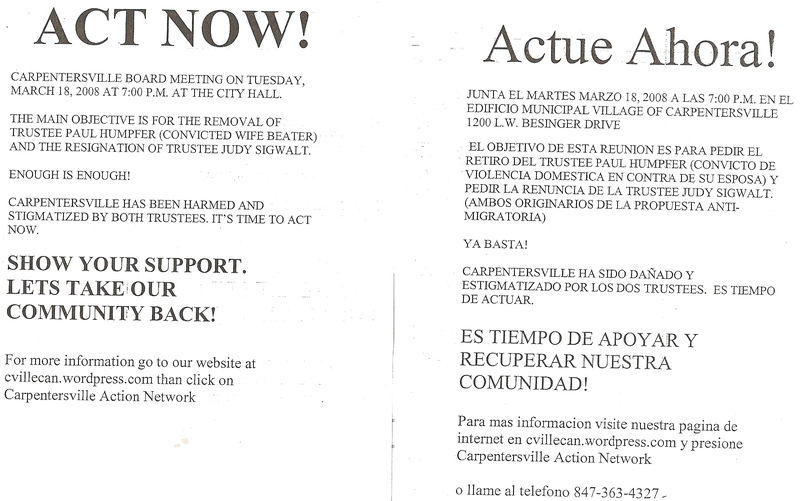 The fliers are exhorting people to appear at this Tuesday night’s board meeting in Carpentersville and demand the removal of trustees Sigwalt and Humpfer from the Village Board. In response, others are now transmitting requests for people to show up in support of Humpfer and Sigwalt at tomorrow’s board meeting. Our Friends at Fox Valley Citizens are in need of our support: Here is an important message from them. Your support is needed at the Carpentersville Village Hall meeting this coming Tuesday, March 18th at 7:00pm. Village Trustees Paul & Judy, who have been our support in the fight to stop the invasion of illegal immigrants in the Fox Valley are being attacked by Village President Bill Sarto. There has been tremendous support from the other side in the past few days to have Paul and Judy removed from the board. There is expected to be a great number of people at the meeting to speak in support of President Bill Sarto and his intensions to have them removed from the board this Tuesday night. Please gather together your thoughts and as many people who share these same thoughts and bring them all to the Village Hall Meeting this Tuesday night to show our continued support for Paul & Judy. If there has ever been a need to speak at the Village Hall Meetings, now is the time to show up and speak up in support of Paul & Judy. You do NOT have to be a resident of Carpentersville to speak, just be aware that there is an ordinance that allows residents to speak before non-residents – SO SHOW UP EARLY AND GET SIGNED UP AND MAKE YOUR VOICE BE HEARD!!! Thanks in advance and we look forward to seeing you all there! It has come to light, since I sent this out, that they are sending spreading fliers around town (in both Spanish and English) telling everyone to be there by 7:00, in the hopes that by being there 30 minutes early they can crowd the Village Hall and force us all outside. So, it imperative that we have a strong showing at the Village Hall Tuesday night and that our supporters arrive early enough to force them out! Remember This Has Been a Battleground Before as People from all over were bused in!!!!!! MARCH 18, 2008 — 7:30 P.M.